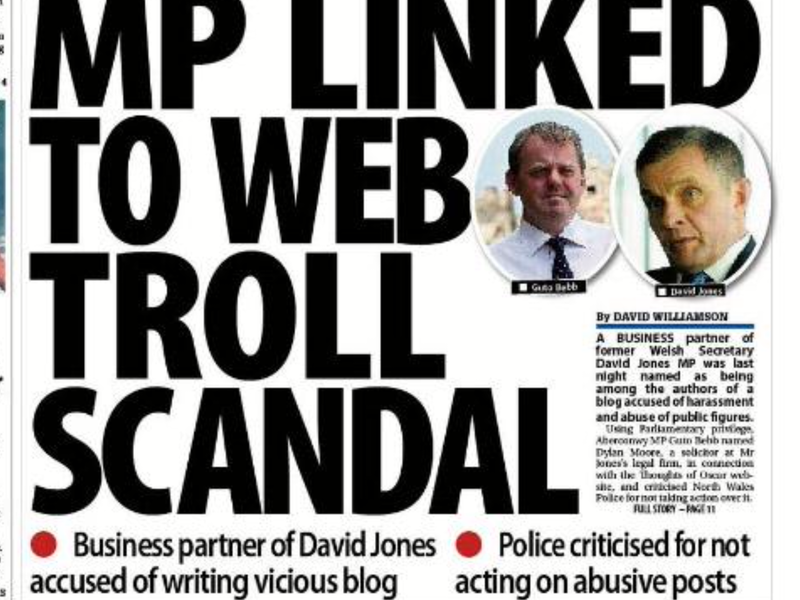 As David Jones MP for Clwyd West fights to retain his seat the stories of his involvement with the troll blog ‘Thoughts of Oscar’, will not go away. That disgusting blog and its authors/contributors, which we know that not so honourable MP was one of, is responsible for so much upset and discord over a seven year period. Last September Guto Bebb, David Jones’s conservative colleague, implied in a speech he made in The House Of Commons regarding the Thoughts Of Oscar Troll Blog, that David Jones was indeed one of the blogs authors. Mr Jones vehemently denied this, indeed he phoned me out of the blue and spent 40 minutes trying to convince me of his non involvement in the blog. As a result of that phone call he then invited my wife and I to a meeting at his constituency office during which he spent 57 minutes denying ever having anything to do with the blog in anyway at all. Yet in a later meeting with his long term business partner Mr Dylan Moore, Mr Moore repeatedly stated that David Jones had been a regular contributor/author to the Thoughts Of Oscar Troll blog. This has all been publicly aired before, but refuses to go away. I believe Mr Jones will before long find himself in a bit of a mess, after all for every lie he tells he needs to tell at least two more to cover the original up. Now we are all aware that politicians are not the most honest people at the best of times but Mr Jones takes dishonesty to a new level. Although I like many others want to see Gareth Thomas succeed in beating David Jones in the forth coming election for Clwyd West, I hope that David Jones does retains his seat, why you may ask? Mr Jones is an embarrassment to the Conservative Party, even his chief whip, Michael Gove has had to take him to task about his dishonesty, David Cameron sacked him from his cabinet position as Secretary Of State for Wales, he fiddled his expenses to the tune of £81,000, he used his position to get his friends privileged audiences with high ranking police officers, as a member of the Masons he has help influence certain legal cases. This man is the most corrupt and dishonest person I have ever had the displeasure of speaking to and if he retains the Clwyd West seat he will undoubtedly bring more shame and scandal down upon the Conservative Party, which from the point of view of many can and will be a good thing. ← Previous Previous post: A short note. Next → Next post: Wonders never cease…..Nigel Roberts Of Nigel Roberts Newsagents in Llandudno comes out with it….. Your a nob what do you no about Mr Jones, you need sorting.